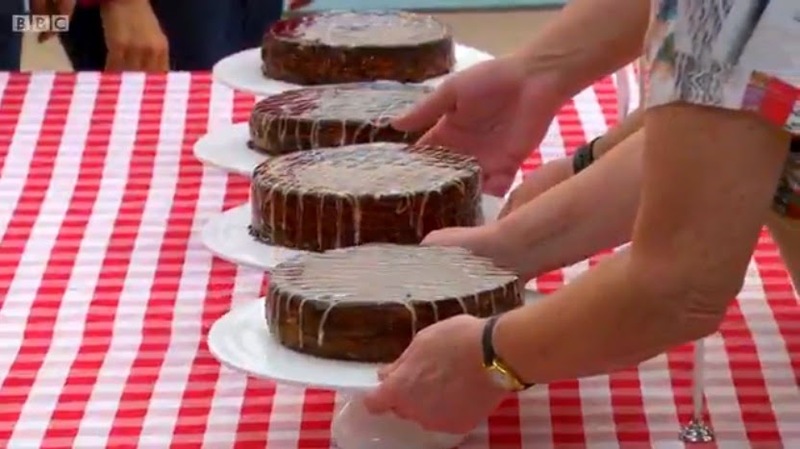 Can you believe it was the semi finals of The Great British Bake Off last week already?! As usual it’s gone so quickly. 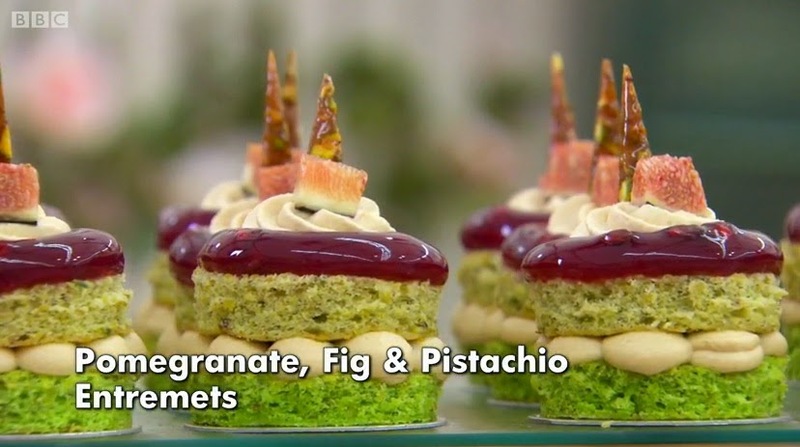 The theme for episode nine was patisserie, although there wasn’t much pastry being made… it was more to do with layered desserts. The first challenge was the only challenge that involved making pastry. 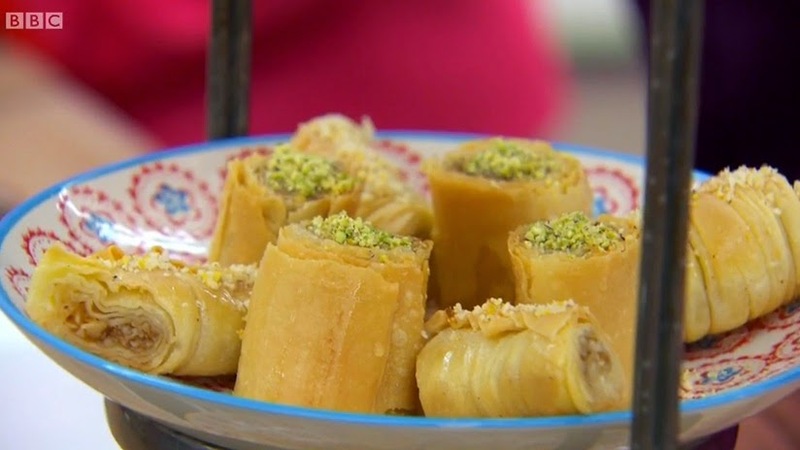 So the judges asked for two different types of Baklava, a Turkish pastry made with layers of filo and filled, usually, with pistachios and walnuts. Syrup is drizzled over the Baklava after baking. The bakers were allowed to flavour and shape the Baklava any way they liked. Richard stayed traditional with a Pistachio & Rose Baklava, and a Walnut & Almond Baklava. While Chetna experimented with a Chocolate Orange Baklava, and a Masala Chai Baklava. I was intruigued to see how they all shaped their Baklavas differently. Only Nancy made the traditional square shaped ones. Everyone also had their own way of pronouncing this pastry dessert’s name! The bakers all made their own filo, which has to be stretched out into a giant thin layer. As Chetna said, it’s impossible to get it as thin as the store bought kind, because that is done by a machine. However, the bakers filos all looked pretty good! 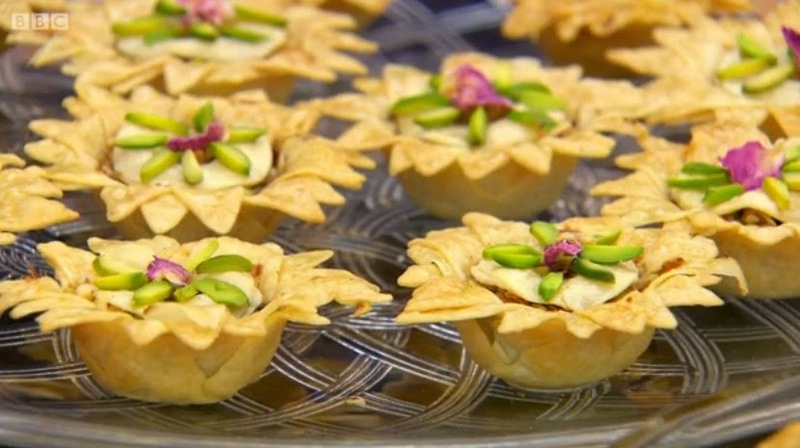 Luis flower shaped Baklava’s were criticised by the judges as they were not ‘proper’ Baklava. Nancy also shoved aside tradition by filling her Baklava’s with muesli, and got great results. confused as it just didn’t look like enough batter. Some of them ended up with less than 20 layers (of course Paul counted them during judging…). They weren’t provided with a grill temperature or a time to grill for, some bakers timed the layers and some just judged it by eye. 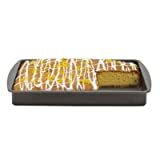 I thought that all this grilling would make the cake quite dry and on Extra Slice they confirmed that it was a very dry cake. The enternal Bake Off problem of not having enough time for things to cool caused problems with the chocolate glazes. Why can’t they give them enough time?! I cry every time I watch the show. Luis came first, Richard second, Nancy third and Chetna fourth. 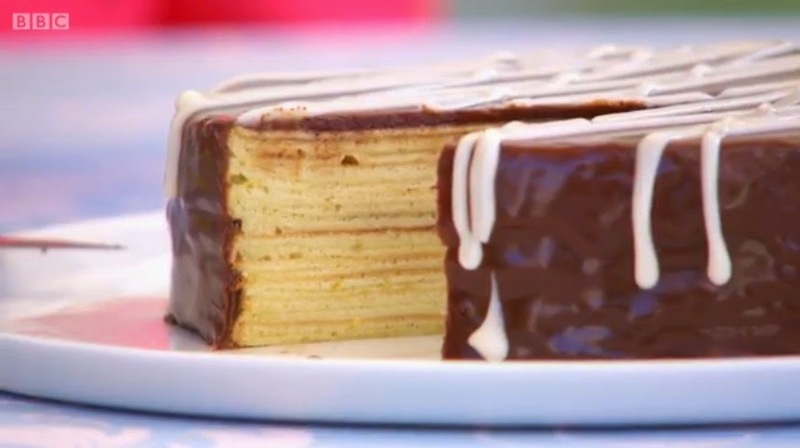 The bakers were really tested this week with the showstopper challenge. They were asked to make two different types of Entremets, 12 of each. Entremets are the small fancy cakes you see in the window of high end patisseries. Mary wanted to see polished works of art, and Paul wanted precision, beauty and elegance in miniature form. The bakers layered sponges, mousses, creams and jellys to make these tiny treats. 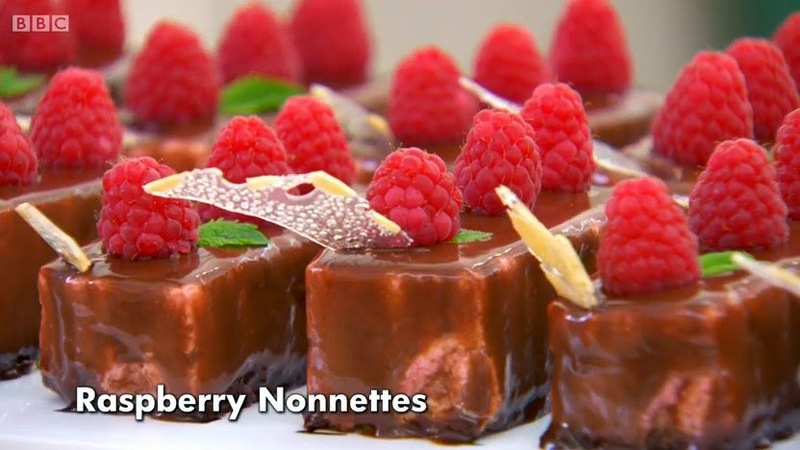 Some of the bakers left their layers visible like Richard with his Hazlenut Mocha Entremets, whereas Nancy covered her Raspberry Nonnettes in a chocolate glaze so that the layers were revealed on cutting. She did very well in judging for flavour, but was marked down for apperance. 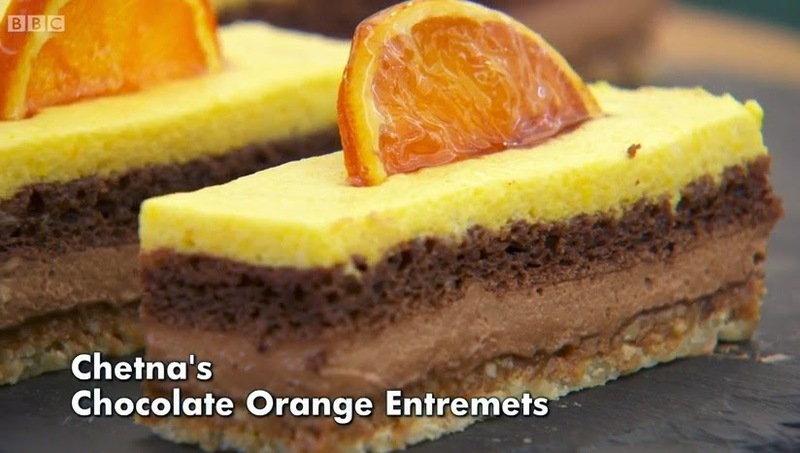 Chetna’s Chocolate, Orange and Nut Entremets looked stunning, but the judges though they lacked in orange flavour, they also thought her Cappucino ones were untidy and the coffee was too strong. 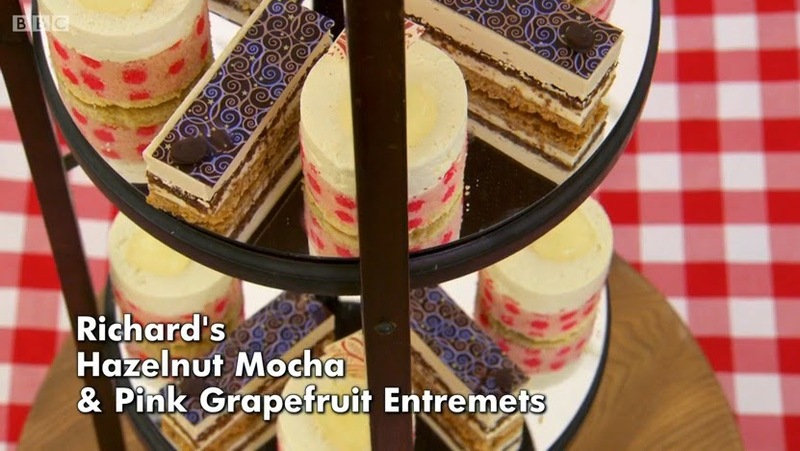 Paul called Richard’s entremets “extremely good”. Luis also did very well. Chetna left us this week. It was very sad to see her go as she is an amazing baker, but based on this week’s bakes I think it was the right decision. Richard smashed his own record and received Star Baker again!! Next week it’s the final! I personally cannot wait. 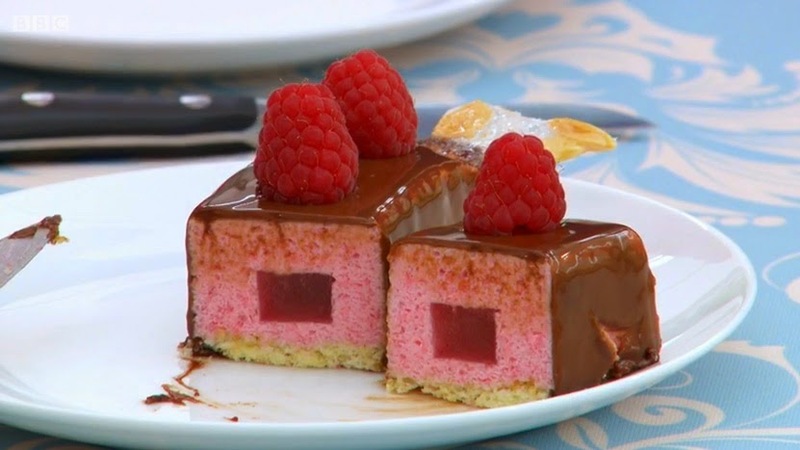 I had thoughts of making an Entremet this week, but the whole idea of it made me quite stressed! And being stressed before I bake something is not what I want. I bake for enjoyment and I need to be excited about what I’m making. As I am not a fan of traditional Baklava, I decided to change the flavours to things I do like and make Salted Caramel & Pecan Baklava! I started the night before by making the syrup as it needs to cool overnight in the fridge and thicken up. If you can’t do it the night before, make sure it has at least 2 hours cooling time in the fridge before using. On a low heat in a pan I heated brown sugar, sea salt, water and honey (you can replace the honey with golden syrup if you like). Once the sugar is dissolved, let it boil for 10 minutes, stirring constantly. Pour into a bowl and cool in the fridge. For the filling I roughly chopped up pecans. 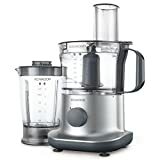 I added the pecans, light brown sugar, cinnamon, nutmeg and salt into a food processor and pulsed them until they looked like a coarse crumb. Before layering the Baklava I melted butter in a pan and stirred in light brown sugar until it dissolved. In a deep sided baking tray I starting layering up the filo sheets, brushing butter between each layer. I did 10 sheets of filo per layer. I didn’t make my own filo, I bought 2 packs of Jus Roll. I have made filo before, if you’d like to make your own (or have a nosey at how I got on!) you can check out my Fruit Strudel post. After doing 10 filo layers, I added a layer of the pecan filling. Then I did 10 more filo layers again brushing butter in between, then another layer of pecan filling, then 10 more filo layers. Reserve some of the filling for topping the Baklava after baking, about 2 tbsp should do. I sliced the Salted Caramel & Pecan Baklava up into pieces before baking. They baked on 180C/350F/Gas Mark 5 for 30 minutes. It was quite golden brown by then so I covered it in foil to avoid it catching. I turned the heat down to 150C/300F/Gas Mark 2 and baked for another 25 minutes. When it was done I immediately poured the syrup all over, then sprinkled the remaining filling in the centre of each square along with a sprinkle of sea salt. The pastry of the Salted Caramel & Pecan Baklava was beautifully crispy and made a great sound when I bit into it. The syrup made it sticky and sweet. I loved the contrast between the saltyness and the sweetness, much better than the traditional Baklava I reckon. My boyfriend demanded that ‘not all of these are being taken into your work!’ So the Salted Caramel & Pecan Baklava must have been good! Oh wow, salted caramel baklava sounds like the best thing ever! I don't blame you for not wanting to make your own filo this time, it looks like hard work. I was sad to see Chetna go and I'm also sad that I haven't had chance to bake anything from this year's series. I think they've really pushed the bakers this year and I now have a long list of things I want to have a go at baking myself as soon as I get the chance. That baklava looks super scrummy Kat. I love it in pretty much any form or flavour, but haven't made it for several years, which is no good at all! Yay, we've both been baking with pecans. That photo workshop you attended is working BTW :)! This looks the real deal Kat…… Love the use of salted caramel with the pecans. I can almost hear the crunch as you bite in just by looking at it. Well done! I'm impressed (again!!!)…. 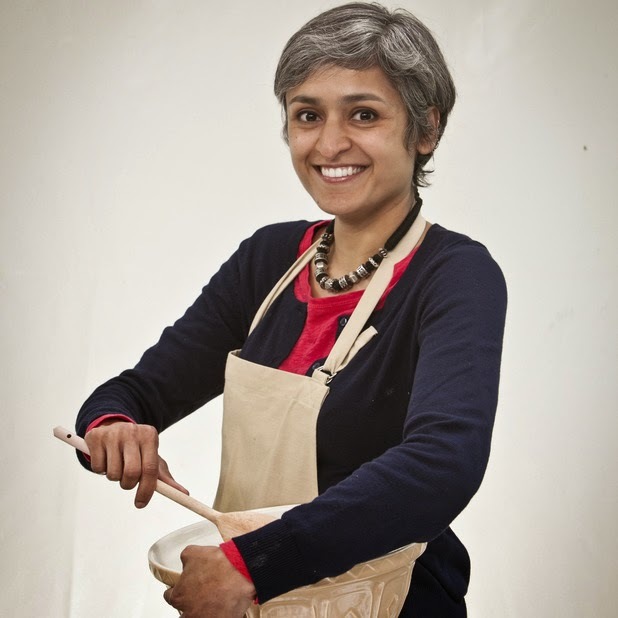 Can't believe the bake off is over now, but I'm glad Nancy won, she was very good. The baklava looks declicious by the way, I love pecan and salted caramel. They should include that in baklava more often! Yummy!